Don’t you?! I always go to the fabric shop to buy one thing and end up walking out with tons more than I expected… what a surprise, eh? 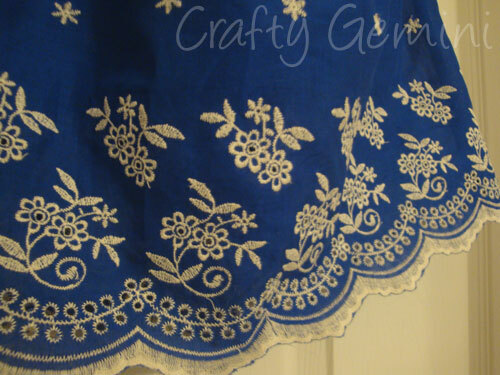 Last week I was at my local Joann’s and came across this gorgeous lightweight blue cotton fabric with the prettiest white embroidery and scalloped edge! The craziest part was that it was in the clearance section and marked down to $5/yd! Even better, the clearance was markdown another 50%. All in all, this dress cost me $1.50 to make, ribbon and all! You see, people….you can be creative on a budget! As soon as I saw it I immediately thought of making a pillowcase dress with it! But for who? ?……read on. When their daughter, Sayuri (means Lily in Japanese), was born I made her a quilt with her name quilted on it. So, for her 2nd birthday I had to make her something, of course! I didn’t have to think too hard about what I would make since I have been doing nothing but teaching pillowcase dressmaking classes for the last month! I didn’t want to use fabric from my stash so, I convinced myself I had to buy MORE fabric! I jumped through cyberspace right on over to the Quilting Lodge online shop and surfed through the new Timeless Treasures fabric line they have. I ordered some of this gorgeous black, white, and yellow floral print a few weeks back and I am sooooo glad I did because I popped on over today and this fabric is already gone! phew! That was close. But they still have a ton more fabric, including some other super cute black, white, and yellow fabrics from the same collection. Quilting Lodge’s prices are great! 1/2 yd of fabric for only $4.00! And their shipping rates start at $2.00! Pretty ridiculous, if you ask me! Their customer service is amazing, too! I have ordered from them and within the hour of me paying, I have received an email letting me know my stuff has shipped! wow! Vicki is great and always available for questions or concerns. Check them out! This dress has a black trim with matching ruffle and I used some black satin ribbon for the shoulder straps. 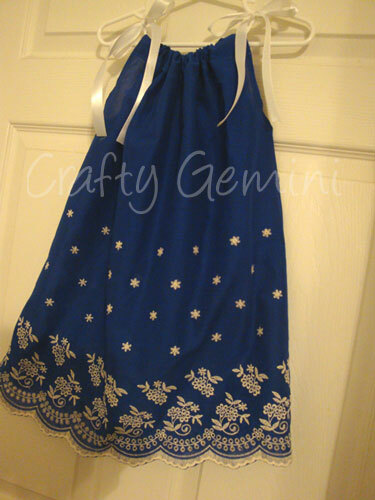 If you have seen my other pillow case dresses you know that this one is a bit different because of the ruffle. I am working on the pattern and tutorial for this specific dress so, look out for a blog posting about it soon. In the meantime you can get my pattern and tutorial for the dress without the ruffle here. My patterns come with a link to a video tutorial to help those of you that are more visual learners. 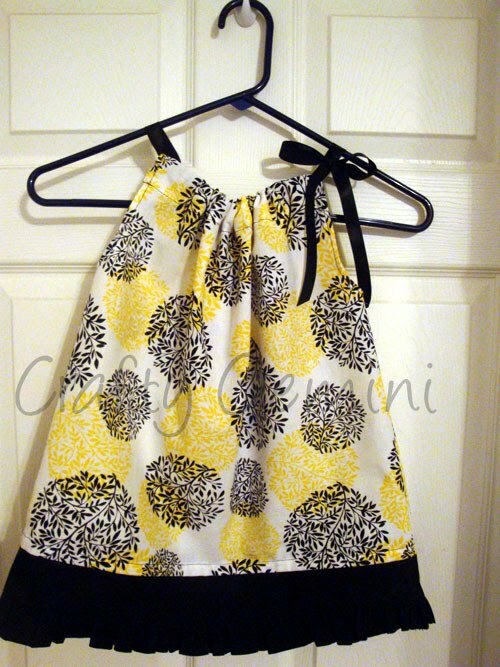 The video tutorial for the pillowcase dress is here: Pillowcase Dress Video Tutorial. Happy Father’s Day to all the great daddy’s and single mommies (like mine) out there! Your new fabric was perfect for your pillow case dress! It’s absolutely beautiful! i am going to buy some patterns from you and i dont know how much to buy.